Top chef, food writer, food consultant and former chef to the rich and famous, Angela Gray is one of the leading lights on the food scene. At a very young age, Angela applied to a prestigious agency in London. She was soon sent on her first assignment to work for a count and countess in their chateau in Belgium – and was invited back for several years after. There followed assignments in Paris, Switzerland and Canada. On returning to Britain, Angela worked in hotels, ran a restaurant and was commissioned to cater for exclusive art exhibitions, business launches and private lunches. Angela Gray wrote for 'A Taste of Wales' and it was because of the success of this that she was commissioned for her first television series which was subsequently re-commissioned. There followed a great deal of television and radio work, including the series "Hot Stuff" and "More Hot Stuff'. A book followed named after the series, containing all the recipes and anecdotes from the programmes. Her radio programme "My Life on A Plate" had her grilling guests like Kim Howells, Lowri Turner, Stephen Bull and John Humphries about what their favourite menu would consist of. Angela Gray is also in much demand on the cookery demonstration circuit. Angela also makes regular appearances on UK Food Live and has worked with many of the top names in the business like Paul Rankin, Brian Turner, Antonio Carluccio,Jean Christophe Novelli, Anthony Worral Thompson and Lesley Waters to name but a few. Angela Gray is passionate about what she does and feels it important to raise food awareness via education, giving talks and writing books on the subject. Angela does styling for food photography and television commercials, is involved in recipe development for books and now also runs an impressive culinary school 'Taste In The City' where she shares her studio kitchen with friends from the culinary world offering audiences an eclectic mix of flavours from around the world. 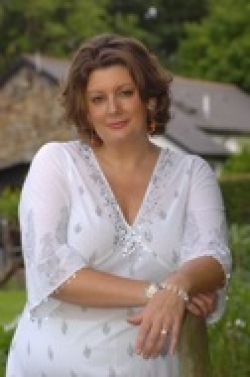 Angela Gray has written 'The Welsh Cheese Book', a must for cheese lovers. Currently Angela is working on a lifetime ambition - a book on healthy eating which has maximum taste. In October, 2007 Angela became Court Director at Wales' first Food and Wine School at Llanerch Vineyard in the Vale of Glamorgan. The School offers everything from corporate team building events to hands-on masterclasses. Angela is also busy lobbying a food education project 'Cook Start', which not only nourishes body and soul but demonstrates the importance of understanding food in both local and global terms. Angela was the regular chef on BBC Wales' Jamie Owen and Louise Elliott show.